Participants must complete a 2015 Participation Waiver (coming soon) prior to dancing in the parade. Waivers forms will be published soon by the parade officials, and available on this website. Part homage, part Halloween, the ‘Dawn of the Zombie Apocalypse’ is Chicago’s ultimate zombie thrill dance, and the brainchild of event organizer Troy Hilbrands from Dardanus Productions (DPi). Paying tribute to Michael Jackson’s Thriller, the parade of dancing zombies encourages people from all walks of life, dance levels, and age groups to participate in the free community experience. Hundreds are expected to peacefully gather at the Lakeview Halloween Parade on Saturday, October 31, 2015 to march and retrace the dance steps of the legendary 1983 Michael Jackson hit music video “Thriller”. Additional information including rehearsals, line-up, and helpful tips will be submitted to participants via email and website as the event nears. Event organizer and volunteers are excited to bring the “Thriller” dance to the streets of Chicago for its fourth year. Go to "Parade Day" (above) for DOTZA day-of information. Dates, Times, and locations are subject to change without update to this page. Please follow us on Meetup, Facebook or Twitter for all updates. A: Absolutely nothing! Currently the event is privately funded as a fun community outreach event. However, to help keep this even free, please consider making a donation that will go towards offsetting costs (rehearsal studio rentals, web hosting, marketing, sound equipment, giveaways, etc). Consider donating during registration. Q: What is "Dawn of the Zombie Apocalypse”? 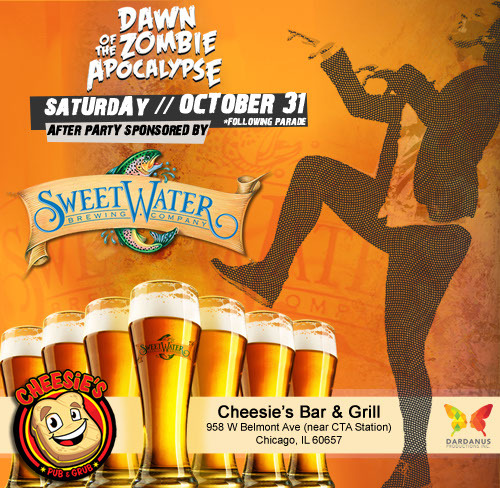 A: We’re celebrating our 3rd year in the Halloween Parade…by assembling all of our friends new and old to break it down MJ style with Chicago's thrill dance—Dawn of the Zombie Apocalypse (DOTZA)! A Michael Jackson Thriller tribute and zombie dance mob…DOTZA stemmed from a part of series of themed events that launched in 2012. A: Saturday, October 31, 2015. See Rehearsal Dates/Times/Locations Schedule tab for further breakdown. A: The main event will take place in Chicago's Lakeview neighborhood during the Halsted Halloween Parade. The 2015 Halloween Parade kicks-off at Belmont & Halsted, and goes North down Halsted ending just before Addison. Q: May I join with my dance group/team? A: We welcome teams and groups of friends to join. You can indicate your team's name and point person in the registration ("Register"). Keep in mind that everyone will be given a GROUP ID, but registering as a group will help keep you all together. Q: May I participate as an individual? A: Heck ya! This event is for everyone, and a great way to meet new people. Everyone will be given a GROUP ID a few days prior to D-Day. Q: Do you have to dance? A: Depending on the response, we will have people that are walking with the dance troop and hold signs or passing out stuff. However, you must register to qualify. A: The length of the event will depend on the number of entrants. However, you can roughly plan on a few hours (3-7pm). The actual dance will only be about 6 minutes, but will be repeated as the group moves down the street in the parade. Q: What do I need to contribute to make it a successful event? A: Prepare! Start learning the dance moves, get your costume and make-up ready, and attend the rehearsals. Most of all come with a good attitude and ready to have fun. 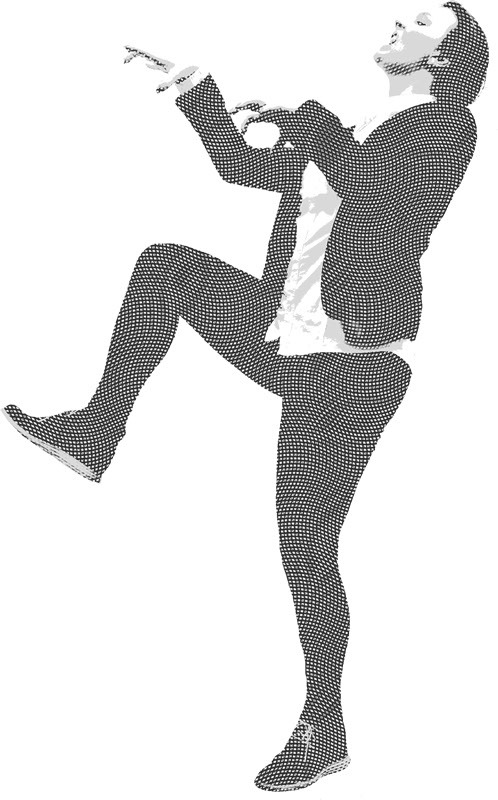 A: Aside from the fun of dressing up like a zombie you'll also be joining other MJ fans who want to do Thriller with a large scale group. The energy is pretty amazing, and you'll have the satisfaction of being a part of something unique. It’s also a great way to meet new people and have some fun on Halloween. If you've seen flash mobs on TV and always wanted to give a try, then here's your chance. Q: Who else will be participating? Q: Do I have to be a dance professional? A: Nope! Anyone can participate, and we welcome people from all dance levels. However, those folks with more experience will most likely be a team lead. 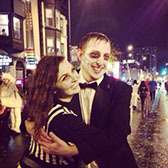 Organizers of the 2015 Thriller tribute dance Troy and Julie each bring something unique to this event, and making it happen. Both MJ fans, these two became friends at the first DOTZA parade dance (2012). From there each found their role, with Julie taking the lead in instructing the dance, and Troy working mainly on the behind -the-scenes. Darrdanus Productions, Inc (DPi) is a Chicago based production and event company established by Troy Hilbrands. Our projects focus on social experiments, charity initiatives, and creating events that center on user experience based on vivid and unique atmospheres. Troy Hilbrands comes from a long history of design and visual arts, and has hosted dozens of charity events over the past 10 years. From a young age he learned how to do popular and tap dancing, and lists Michael Jackson as one of the most inspirational performers. As an avid music fan from a variety of cultures and genres, Troy likes to experiment with different sounds and they can be interpreted visually.